Bayern Munich coach Niko Kovac has experienced a tough start to life at the club as the defending champions struggle to find their feet in the Bundesliga league. The German league leaders Borussia Dortmund are nine points ahead of Kovac's side after they were dealt a last-minute blow when they gave up a two-goal cushion in their stunning 3-3 draw with Fortuna Dusseldorf on Saturday. As the Bayern boss faces more pressure, he has turned his attentions to Benfica's visit in the Champions League on Tuesday with a win needed to help turn his side's fortunes around as they head towards the Christmas break. 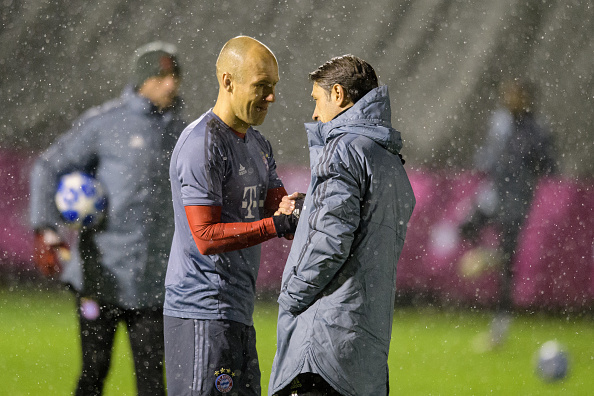 After his side trained in wet condition on Sunday evening, Kovac knew the importance of what all three points would do for his side. A draw for the reigning Bundesliga champions on Tuesday would see them seal their place in the last 16 but a win would give them the best chance of advancing as group winners in their penultimate game ahead of their trip to Amsterdam.